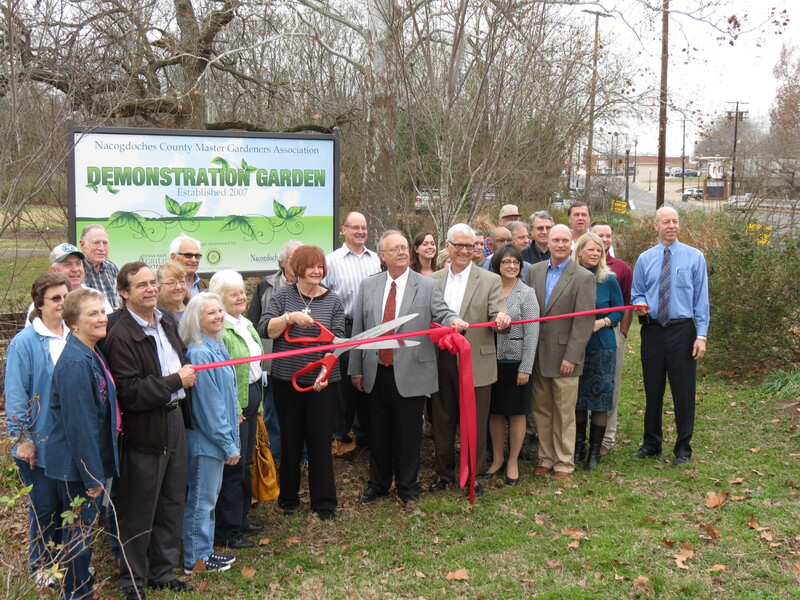 On 01-24-2013 the Nacogdoches County Master Gardeners had the dedication for their new signs. We wish to thank all who had a part in getting and participating in the sign dedication. 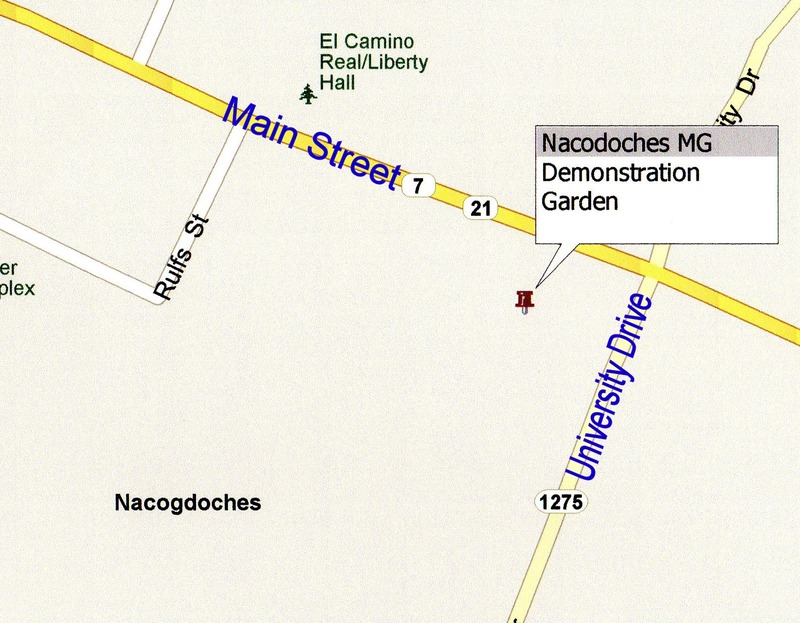 In late 2007, the city of Nacogdoches granted a request by the Nacogdoches County Master Gardeners to develop a 7.3 acre tract located at the corner of Main Street and University Drive for a demonstration garden. There is a 20 year time frame for completion of the large acreage. Early in 2008 the process of clearing and developing the land began. This site was the old Aqua Vitae Park that opened in 1909. At one time the park was the site of a chicken processing plant that closed years ago. Butterfly garden, azalea and camellia beds created. A large bulb garden planted along University Drive. Varieties of bald cypress, maple, oak, sycamore, and crape myrtle trees are growing. A large vegetable garden is in place. Tyler Hospice Memory Walk, surrounded by roses and a row of magnolia trees, is the focal point as you enter from Main Street. Park benches placed throughout the garden. Over 4,000 feet of water lines and drip irrigation installed. Boy and Girl Scouts had planting and building projects for merit badges. A gazebo was relocated from the Medical Center to the University Drive side of the garden. A kiosk near Main Street entrance lists the many businesses and individuals who have donated time, energy or materials to the garden. SFA artists painted a concrete retaining wall with nature scenes. Many more accomplishments and changes are planed for the future. We hope you plan to be a part of these upcoming changes by volunteering and helping out in the demonstration garden. Come out and help make our garden your garden! Community service volunteer hours are Friday mornings from 9 – 12 a.m. The Demonstration Garden is on the corner of East Main Street and University drive.